The average business has $30,000 worth of computer data. At DataSet Technologies, we have found that many of them have little or no protection at all. As a Houston business owner, your data is priceless. The loss of your data can put you out of business. In fact, according to Home Office Computing magazine, 30 percent of all businesses that have a major fire go out of business within a year. Seventy percent fail within five years. DataSet Technologies uses the Internet to automatically send copies of your critical data to our off-site data storage facility every night. The system is affordable and secure! 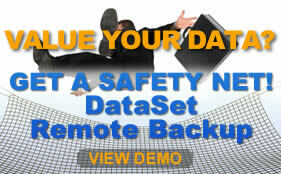 View the online Demo of the DataSet Online Backup Manager and the DataSet A-Click Backup. For a FREE consultation on remote backup services provided by DataSet Technologies, contact us online. The consulting company, Newell & Associates had a disk drive crash six months after it began operations. And, even with a fully backed up system on a tape drive, it took over five days to get a critical computer system restored. Newell & Associates spent several months investigating all the alternatives to manual backup systems. And, finally decided that the best backup system is the one used by Fortune 500 companies. Companies like IBM, GE, and Amoco. Newell & Associates then spent several months searching for the right hardware and software to enable this backup system to work for a typical company. Without the high overhead. The electronic vault system is set up so that at a preset time, usually late at night the clients computer automatically wakes up and prepares its data for backup, it determines which files have been modified since the last backup, compresses them, encrypts them for security. When the data is ready the computer uses its Internet connection to contact our Servers and transmit the data. Our Servers verify and store the data. Your data is safe and can not be read except by your client software with its own unique encryption code. DataSet Technologies is committed to providing highly effective backup systems to all customers, from the one-person business to multiple office businesses with highly complicated business needs. We have created a price structure that is affordable and flexible depending on the size of your backup needs. Please call for details. How valuable is your data? Can you afford to trust your data to just a tape system or a backup service that is geared to quantity instead of quality? We offer daily backups, email notification of missed backups, and custom data retention plans - all for one low monthly charge! *Additional charges may apply for any on-sight installation requirements. Using a tape backup system and a remote backup system offers the best of both worlds. Critical files, like billing, customer contact files, and databases can be kept on the remote backup system. At the same time, the tape system can be used to create a full backup of the entire system once or twice a month instead of on a daily basis. The tapes and drive will last longer and require less maintenance. The remote backup system can provide a quick and easy way to retrieve critical files and databases without the hassle of searching through tapes. Frankly, we believe that it is not ideal. Most users should not use a zip or other removable disk media for backup. A remote backup service is completely automated and has the required file redundancy to protect important data. The only safe way to use a zip drive for backup is to have three disks and make the same backup three times. That way, when one of the disks fails, you are still protected. Offices with high-speed internet connections should find this service comparable with tape drives. Dial-up users will be able to do incremental backups in thirty to sixty minutes. The initial backup can take several nights to complete. We recommend backing up the most important files first and then selecting other files as the backup progresses. Another option is to run the initial backup over the weekend. Also, a representative of DataSet Technologies can come to your office and make the initial backup of your system. Remote backups work like regular tape backups with one important difference: instead of sending backups to a tape drive or other media attached to the computer, a remote backup sends encrypted file data over the internet to a computer file storage system safely off-site. This usually happens at night while your business is closed and nobody is using the computers. It's completely automatic. Status reports are sent to you detailing the result of each backup. The data is immediately stored off-site using an automated backup system. Also, only an internet connection is needed. The need for expensive backup equipment and media is completely eliminated. Also, since the system is automated, manual labor is eliminated. Very. All files are encrypted using Blowfish or DES encryption, which is selected by the user who has his own personal encryption code known only by the user of the system. Blowfish encryption has never been broken by a hacker, and DES is used by the federal banking system. Encryption is a mathematical formula that scrambles a data file. The only way to unscramble it is with the encryption code.